Dublin’s finest metal exports, PRIMORDIAL, will release their long-anticipated new studio album, “Where Greater Men Have Fallen“, on November 25th, 2014 via Metal Blade Records. The album will be available on CD and vinyl. “Where Greater Men Have Fallen” will also be released in limited European deluxe edition wood boxset which includes the CD+DVD digibook, an exclusive 7″, a leather wristband, a poster and a certificate of authenticity. 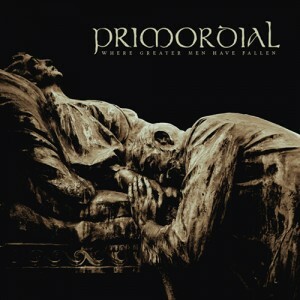 Where Greater Men Have Fallen” serves as the followup to PRIMORDIAL‘s critically-adored, 2011 album “Redemption At The Puritan’s Hand” and boasts some of the band’s deepest, most meticulously composed compositions to date. The eight-track, fifty-eight minute epic was tracked at Grouse Lodge in Dublin with Jaime Gomez (CATHEDRAL, ANGELWITCH, GRAVE MIASMA).